Last week's FOTS 1962 Chevrolet Corvair was one of the first American compact cars ever made and paved a path for the small cars of today. We can safely say no one has ever used the word compact to describe this week's 1972 Lincoln Continental. Unlike the rusty and idle Corvair, this Continental needs only a new owner to be floating down the road in early 70s style. By 1972, when this week's FOTS Lincoln was built, the Continental model already had a long and storied history. The first Continental was commissioned in 1938 by Edsel Ford as a one off personal car. When the car was completed the following year the positive response from Ford's wealthy friends inspired the company to put the Continental into production. Many believe the Edsel Ford ordered the Continental built with the intention of manufacturing the car as a Lincoln. The first Continentals were mostly hand built and only two dozen left the factory before the end of 1939. The Continental was produced by Lincoln in 1940 and 1941 until production was suspended in the wake of Pearl Harbor. Continental production was resumed in 1946 and lasted throughout 1948. When the Continental model was reintroduced for the 1956 and 1957 model years it was as a separate high end luxury brand with only one model, the Mark II. In a time when a normal car could be had for $2500 the Mark II cost 4 times that. Their price made them very exclusive and rare, with only 2,996 made over a two year period before the Mark II and the Continental were discontinued. After a couple years of intentional ambiguity as to whether the Continental was or was not a Lincoln, the 1961 model officially paired the Lincoln name with the Continental model, where it would remain for the next 41 years. This is how it appears on our FOTS 1972 Lincoln. As is the case with many older luxury cars, this Lincoln appears to have led an easy life where it was used sparingly and well taken care of. The odometer shows the car has traveled only 52,000 miles during its 39 years which is backed up by the excellent condition of the car. According to the one of the seller's employees the Lincoln runs and drives and needs only minor electrical work to be perfect (windows and headlights). What initially attracted me to this Lincoln was the For Sale sign displayed prominently on the front windshield of this Continental. 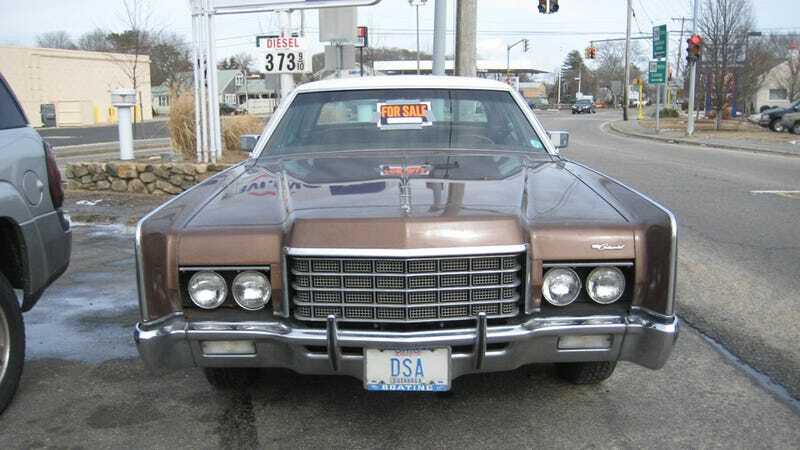 Even to someone who isn't a particularly big fan of brown or luxury cars the $4000 asking price seems very fair for this interesting time capsule. The financial challenge of this Lincoln wouldn't be the initial purchase, but regularly feeding the 224 horsepower 460 V8 in the wake of rising gas prices. My favorite part of this car is the front license plate surround which proclaims the owner would rather be boating. I can't imagine you can get much closer to the boating experience off the water than navigating this pristine old land yacht down the road.